The Dermal Infusion Facial is one of the best treats you can give yourself. It will leave you red carpet ready with vibrant and glowing skin. Hi, I’m Erin and I am the Medical Esthetician here at Restore SD Plastic Surgery. I am here today to talk to you about Dermal Infusion. Dermal Infusion is our machine here that we use> It’s commonly referred to as a hydra dermabrasion machine. What it does is it exfoliates the surface of the skin while also performing extractions, then at the same time infusing different serums into the skin. It’s good for every skin type. If you have acne there’s a solution for that. If you have hyperpigmentation there’s a solution for that. This is a completely customizable procedure that we do here. Best results are kind of up to you. Depending on what we’re trying to achieve, you might want to do it every two weeks, you might want to do it every four weeks. At the very minimum, I would suggest doing it every three to four months just to get a good cleaning and purging out of the skin. 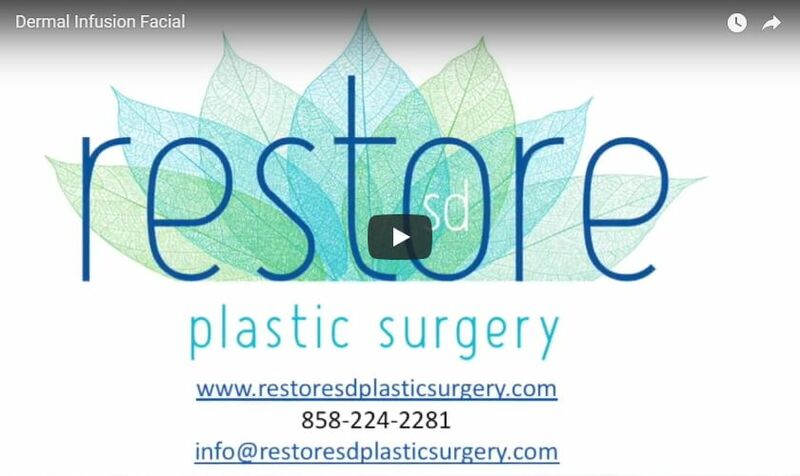 If you’d like, go ahead and make a consult and we can take care of you here at Restore SD Plastic Surgery.